For the detection of Vitamin A and iron deficiency it is possible to measure certain proteins in blood (RBP for Vitamin A deficiency, Ferritin and sTfR for iron deficiency) with a sensitive and inexpensive Sandwich ELISA technique (Erhardt JG et. al. 2004). It can also be easily combined with the measurement of CRP and AGP as indicators for acute and chronic infection. The infectious status can be of interest by itself but also be used to correct RBP and ferritin which are influenced by infection (click on Ferritin or Vit. A to get the publications for this procedure). The combined Sandwich ELISA technique needs some experience and there are problems with the availability of the antibodies but the advantage is that the 5 proteins can be measured for 5 USD/sample (in average 1 USD per protein) with a high throughput procedure in bigger sample sizes (up to 2500/project). As material serum from venous or capillary sampling can be used and already 25 ul are sufficient to do a double measurement of these 5 proteins. Therefore a finger or heel prick is usually sufficient to get enough blood for doing these measurements. 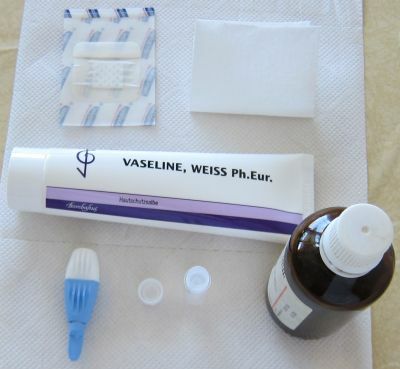 The best material for the measurement of the proteins is serum. Heparin plasma usually forms cryoprecipitates after a freeze/thaw cycle which can block the tips of the pipettor and EDTA plasma can have problems with the stability of sTfR after freeze/thaw cycles. 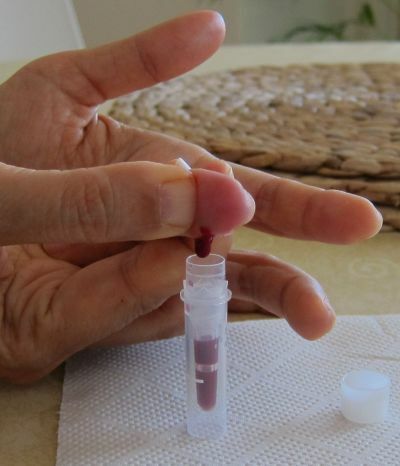 The pictures above shows an example on how capillary blood samples from the finger can be collected into a serum tube. The finger is first disinfected with alcohol, optionally a thin layer of vaseline or silicon spray added and then the finger punctured. After that the blood usually just drops into the serum tube (e.g. the one from Sarstedt which is shown here, ord. no. 20.1308) when the finger is a bit pressed as in this example (not milked). After some time in upright position (20-60 min) the tube can then be centrifuged in a mini centrifuge or a manual centrifuge (more expensive and not so convenient). To increase the blood volume warming the hand, using high efficient lancets (e.g. the blue ones from Becton Dickinson, ord. no. 366594 ), wiping off the blood with a tissue to initiate again the blood flow or adding vaseline/silicon spray to inhibit the coagulation of blood in the puncture hole can be helpful procedures. 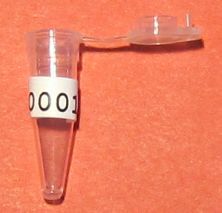 Getting 100 ul serum is usually no problem and can be easily pipetted with an inexpensive 100 ul pipette (around 25USD). Alternatively 50 ul serum and a 50 ul pipette would also be OK.
After centrifugation the serum should be stored in 0.2 mL PCR tubes from Sarstedt (ord. no. 72.737.002). They are more robust than other PCR tubes and can be directly used in an automatic pipetting system to avoid the tedious and error prone manual pipetting. If an immediate frozen storage is not possible storage in non frozen form for some days is possible. Extensive tests at the CDC in Atlanta have shown that proteins in serum are stable at room temperature for one week. Since the conditions in the field can be much worse (temperature > 25°C or higher risk for bacterial growth) it's better to freeze the serum as soon as possible or at least to keep it in a cool environment. A car battery driven refrigerator or some deep frozen water bottles in the bottom of a good styrofoam box can be helfpul for this. 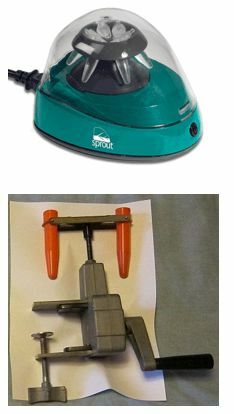 The picture above shows on how special labels from Brady (LAT-29-799) have to be attached on the dry and clean surface of the tube. These labels are made of Nylon and therefore more sticky than other labels. Since it needs some experience to print the ID's correctly with a Laser Printer (tubes with handwritten labels are difficult to handle) they have to be provided by the lab can be send to any place in the world in a Fedex letter. For this only a list of the ID's in Excel or a system (e.g. #0001 to #2000) is necessary. The limiting is that not more than 6 digits fit on one label and the easier the ID's are the less work it is to enter them into Excel. 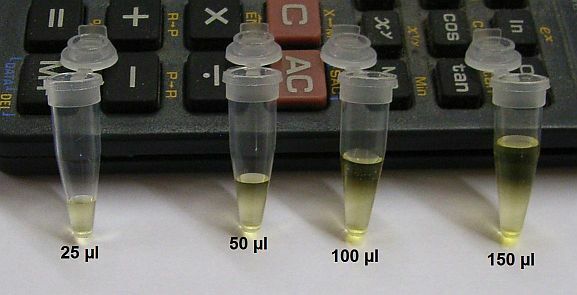 The second picture shows examples on the volumes in the 0.2 mL PCR tubes. To prevent spilling over and to reduce carry over effects the volume should never be more than 150 ul. The samples can be stored frozen in a Ziploc bag but sometimes it's useful to put them into efficient storage boxes (see picture below with a 16*16 grid) to prevent that labels get lost. 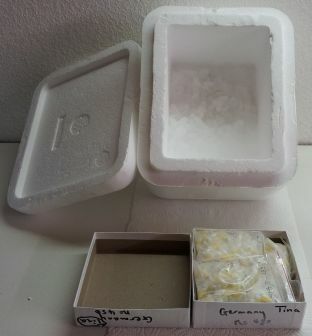 The following pictures show examples of shipment boxes for transporting blood samples below 0°C. 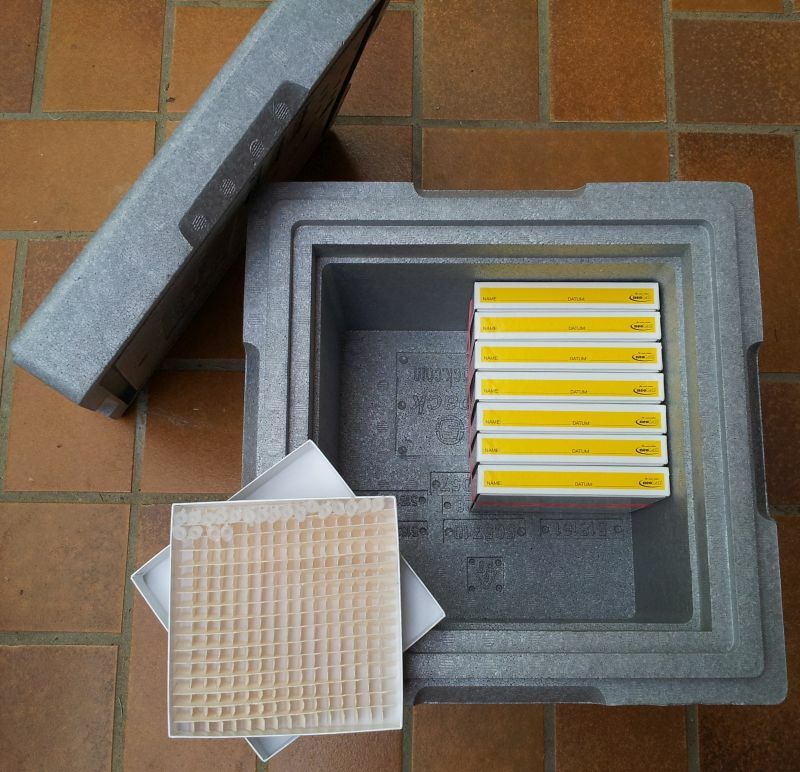 This one is a Neopor box with more than 5 cm thick walls, better insulation properties than styrofoam, tightly closing lid and sample boxes for more than 2000 samples (the grid in the sample box is 16*16). There is still space for adding dry ice which is sufficient to keep the samples frozen for up to 7 days. A small amount of dry ice (< 3 kg) is always allowed without declaration and since every passenger of an airplane transports around 5 L of blood, the shipment of tiny amounts of blood in stable tubes in a good styrofoam box is no risk at all. If the empty space is fully filled with dry ice it's useful to make a small hole with a needle to prevent any build up of pressure inside the box. This box is a less good small styrofoam box after a two day transcontinental transport. It fits easily into a normal suitcase and is therefore also suitable for a personal transport. The tubes are well protected by the Ziploc bags and immobilized in the card box to prevent that labels get loose (aluminium foil around the Ziploc bag can replace the card box). From the orignal 3 kg dry ice there was still enough leftover for a third day. 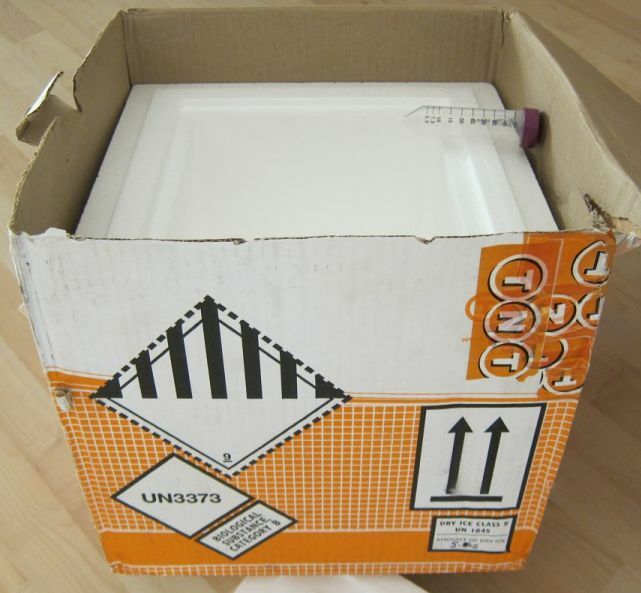 This box shows one which was provided by TNT for a shipment from Nairobi to Germany and included the dry ice and all necessary labelling (UN3373 for biological samples, UN1845 for dry ice). The walls are even thicker than 5 cm and from the 5 kg dry ice which were added in Nairobi there was still plenty of dry ice in the box after a 4 day transport. The cost of this shipment (box, dry ice and door to door transport) was around 500 USD. This picture and diagram shows on how it is possible to transport samples (here 2000 tubes in Ziploc bags) frozen without dry ice. 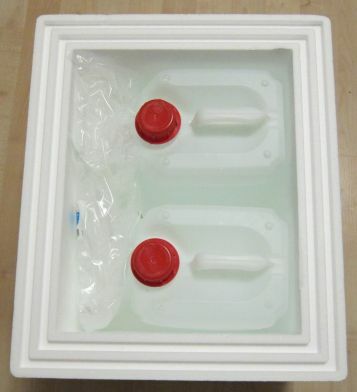 It needs a good styrofoam box in which two 5L container with salt water fits (both can be provided by the lab). The salt in the water (500g per 5L) keeps the temperature in the box longer below -5° (without the salt the temperature would already be after one day at 0°). In this forrm the samples can be kept frozen for almost 6 days which is more than enough for a shipment with a standard courier. Since the 5 proteins are quite robust it's even no problem when the samples would thaw for a not too long time. 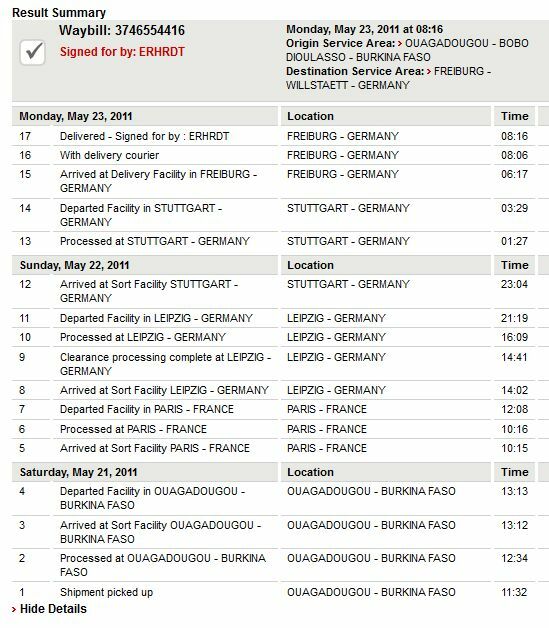 Because of these transport options there is usually no need to use an expensive special courier which can cost up to 7000USD to ship samples on dry ice from Africa to Germany. 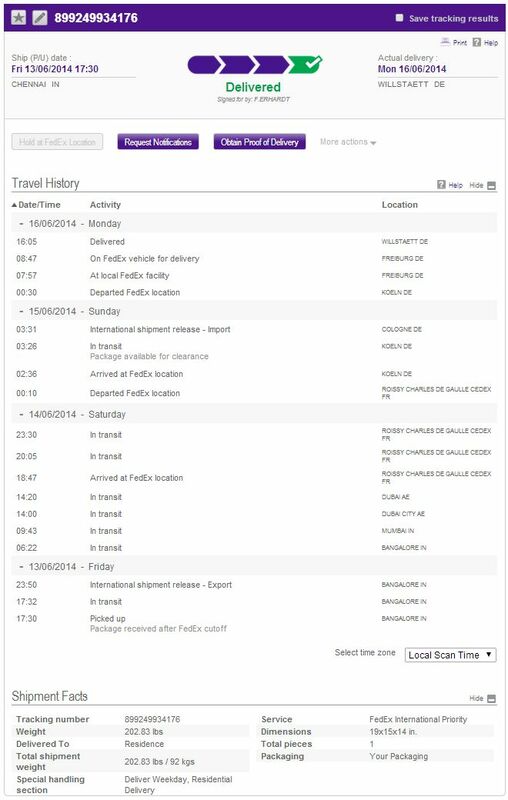 These special shipments take usually also longer than shipments with standard couriers like DHL or Fedex (see examples behind the links). The problem is often that shipments of blood are made unnecessarily dangerous and complicated which increases the effort, the expenses and the time of the shipment. For importing samples into Germany only this letter has to accompany the box (an updated version of it). As long as there are no animal samples in the box and the EORI number included in the address there is usually no problem with the German custom. When a labelling for the content is necessary the important is to use only the UN3373 declaration which is for non dangerous blood samples (comparable with the blood from passengers of a flight). If this letter is attached to the outside of the box the declaration of the shipment is fully correct. In case that a personal transport is possible a handover of the samples at one of the airports around Southwest Germany (Frankfurt, Zurich, Paris) can usually be arranged. This is the fastest and least problematic for shipment requirements. When the only option is a very expensive courier (e.g. > 4000USD) it might also be possible to arrange a much less costly pick up of the samples on dry ice by the lab which is also helpful for negotiation when the cost of a shipment is only high because there is no competition. A personal transport has at least the same safety since all of the transport work can be done by a reliable person (the Federal Aviation Administration of the USA allows for this 2.5 kg dry ice in the baggage which is sufficient for a 24 hour transport). A cargo transport with a special courier like World Courier involves usually several flights and car transports done by different workers where it is always possible that parcels get lost, damaged or stolen. This is an automatic pipettor with the 0.2 mL tubes from Sarstedt in a special rack which can be used to replace the tedious and error prone manual pipetting. Therefore samples which don't fit into this rack (using other sample tubes, inappropriate labels,..) can't be measured. 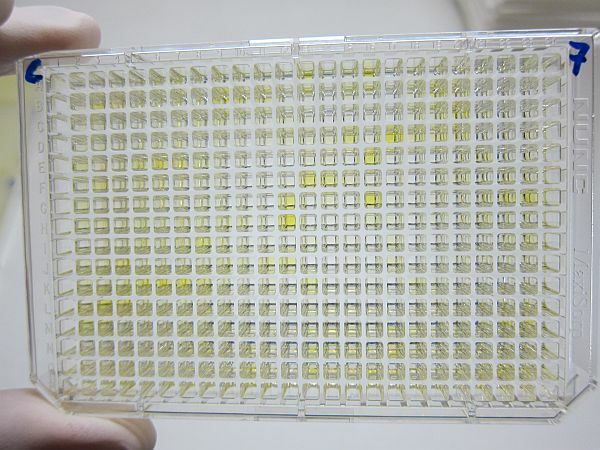 This shows the final result of the ELISA on a 384 well plate (in this picture CRP). The values can then be presented in the following form for the samples and the calibration/quality control. 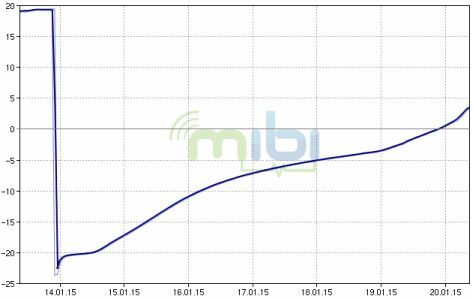 The expenses are relatively small in comparison to the analysis cost and can therefore easily be paid from the lab budget. The much worse would be working with inappropriate material. If anything should be missing or if there is any additional question please send an e-mail to erhardtj@gmail.com. Usually a reply should come in less than 2 days. Otherwise just send a reminder.